New Year, Clean Slate: My 2017 New Year’s Resolutions, or is that Wishlist? Right, it’s time for my look ahead at the things I want to achieve in 2017. It’s a scary, but exciting, year in prospect as at the end of the month I finally quit my civil service job of 30 years. I’m still not sure if I’ve made the right decision, but I know I need to re-balance my life and put family and health first. The decision for the Department of Health to downsize, shedding a third of its staff, seemed the right time to do this. Initially I’m going to take a bit of a break from things. I know I need to step back and recharge my batteries, take time out to relax and learn how to enjoy life again. But then I’m intending to be back with renewed vigour. I’m hoping my regained freedom will leave me more time to concentrate on family history, client work and free up time to take on volunteering roles. Although saying that, I haven’t entirely ruled out looking for a part-time job later in 2017. In terms of personal family history goals I’ve decided to stick to just five. So here goes. 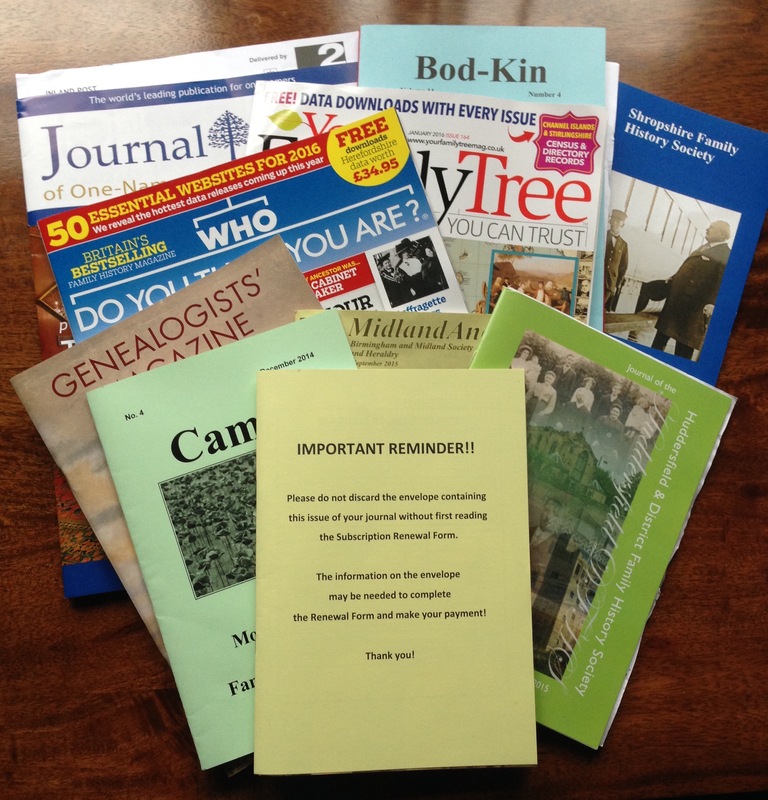 Aveyard One-Name Study: I started this in 2016, and I am taking it at a fairly relaxed pace fitting it around genealogy course work and personal research. But I do want to complete my census data collection in 2017. I also want to go through the new GRO indexes too, to identify any additional entries there, and complement my earlier birth, marriage and death civil registration data. If I do complete all this in 2017 I will be more than happy. Healey War Memorial Project: Another thing I started in 2016. By the end of March I want to complete my data extraction from the 1918 Batley Borough Electoral Register. After a brief panic at the end of 2016, when this crucial book did a library vanishing act, the wonderful staff and volunteers at Batley Library have located it and it is now once more locked away in its rightful cabinet. It’s now full steam ahead with identifying absent military voters. Ideally as part of this I also want to check out the local papers of the time. But realistically, on my own, is this achievable? I haven’t ruled it out though. (Any volunteers to help would be very welcome). Anyway, the absent voters combined with surviving service and pensions records, provide a basis. So, once I’ve completed my absent voters list, it will leave me clear to begin researching and writing up the stories of the men. Blog Posts: Almost by default my blog gathered pace in 2016. Unintentionally I ended up doing a post a week, with some weeks producing even greater output. 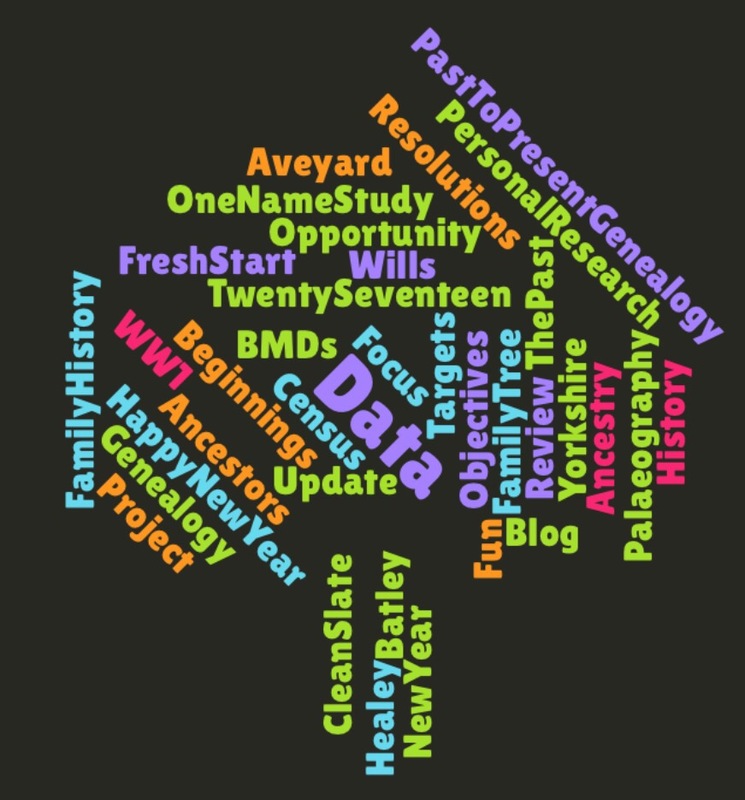 The blog has developed into a mixture of family history research, general genealogy updates and Batley focused posts. Whilst I love doing it, I may not sustain the 2016 level. However I am aiming for a steady two posts per month. I will publish my 2016 blogging review in my next offering. Palaeography Practice: This is something I find a headache (literally). However I know I need to put in more effort. I am aiming to do one transcription per week, to get and keep my eye in. Finally a very personal piece of research: It involves investigating a family history mystery involving a brush maker, Yorkshire asylums, a will and an army officer. This is something I’ve been meaning to do since February 2016. But it is a big piece of work involving many different strands and families, including some transcription work, and I keep getting distracted. Like many others I seem to spend more time on the family history others at the expense of my own. However I want to solve the mystery in 2017 and I’m setting aside July to do it. What may get in the way is my natural inclination to go off on genealogy tangents as new pieces of information capture my imagination, follow new record sets and do research for others. Also I’m committed to an intensive series of courses up until the end of June, which will significantly eat into my time. However I will post a mid-year update. I’m hoping committing to doing so will help my focus on these objectives, and pull me back on track if I feel they are going off the rails. Wishing you all a happy, healthy New Year, packed full of family history fun. This started out brightly. But by October, when I bought my new laptop, they came to an abrupt halt. I still haven’t got to grips with the newest frustration in my life. I have a technology phobia. I loved my old laptop mainly because I was used to it. The thought of having to confront the multitude of tasks that accompany a new machine – such as adapting to Windows 10, loading my Family Historian and other packages or setting up my printer – fills me with dread. And as my old laptop is on its last legs I daren’t use that either. So it’s been a period of avoidance. And now, this holiday season, I’m going to have to be brave and take the plunge with this new family addition. This includes transferring all the muddle of work I’ve fudged together, on a multitude of other devices in this technological wasteland of time, to my nemesis – and backing it all up. Although as I write this (on my iPad) I still can’t bring myself to face the trauma. Record Keeping: I did catch up with cataloging all my outstanding records, and then I kept up with record keeping……for a few months. But by the end of the year I lapsed once more.The computer issues proved one (major) factor in this. The other element is the whole host of new online records, which overwhelmed me. I was like a kid in a sweet shop with the online launch of Irish GRO birth, marriage and death entries, quickly followed by the new online England and Wales GRO index. The final straw was the GRO PDF trial. I now have masses of certificates to add to my latest record keeping backlog. Get a Grip of Subscriptions: A success. All are listed. I am monitoring usage and I am cutting back, albeit reluctantly, on my lesser used ones. A mixed picture here. I did fit in personal research – just not the research I planned. I made no progress with my husband’s tree. Neither did I start mum’s family history book. Other pieces of research took precedence. 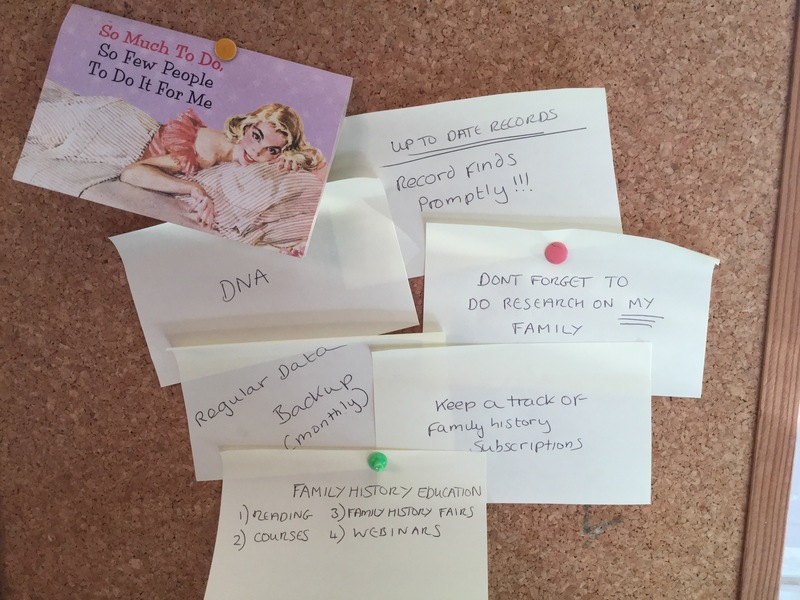 I crammed in a series of visits to West Yorkshire Archives (Wakefield) before its relocation closure, and the results here led to new family history diversions. As did my visit to Tyne and Wear Archives. Not to mention the raft of new data releases. I also took on new, unanticipated ventures. These included starting a One-Name Study, choosing my great grandmother’s very Yorkshire surname: Aveyard. I also launched my Healey Great War Project. DNA: I hold my hands up. This proved an almost total failure. Other than periodically scanning my matches and sending the odd email, I’ve made very little progress. I have responded to the emails I received. Sadly, not all of mine have met with the same response rate. But it’s not been an unmitigated disaster. I’m in touch with some wonderful, newly-discovered distant cousins – it’s now a case of working out the exact links! So there are a couple of key lessons for me. The first is to stay focused on the goals I set throughout the year. The second is to be mindful of my technology issues, and try to address them. Hopefully evaluating my 2016 Resolutions will help me when turning my mind to my 2017 wish-list! I’ve already decided to put DNA on the back-burner though. My blogging output may decrease over the next few weeks as I’ve scheduled some time for learning. 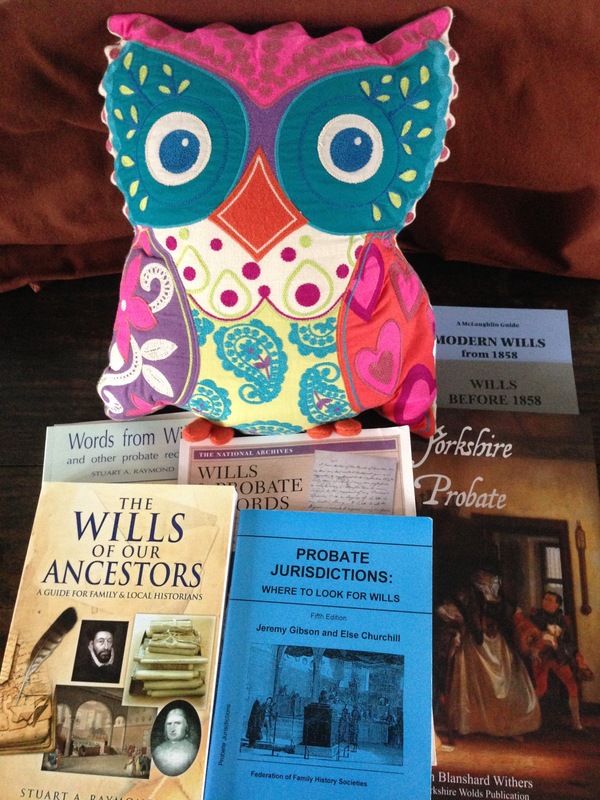 On 23 January I started my latest Pharos Tutors online genealogy course, “Searching for Wills and Administrations in England and Wales”. I’ve completed several Pharos courses and find this online learning method works well for me, fitting around work and family commitments. This will be my final module in their Family History Skills & Strategies (Intermediate) with Certificate programme. The explanation about how these certificate courses work is here. I participated in their 1939 Register webinar at the end of 2015. It was really informative and the technology was easy to grasp worked well, prompting me to book more. So I’m converted to this form of learning. This, and previous webinars, can be found online. Their programme of events is here. And to complete my latest foray into the world of family history education I’ve enrolled on a FutureLearn course, “Genealogy: Researching your Family Tree”. This again is an online course, running for six weeks with a time commitment of around four hours per week. The course is a University of Strathclyde one, so I have high hopes. “……. help you develop an understanding of the basic genealogy techniques and how to communicate your family history. We will consider how to effectively find and analyse sources and explore the potential of DNA testing as applied to genealogy. We’ll help you add historical context to your family history and discuss how to record and communicate research findings in a clear fashion”. This will be my first FutureLearn course, so I’m quite interested to find out how it works and if the learning style suits me as they have a number of other courses I’d be very interested in. So the “keeping informed” element of my genealogy New Year’s Resolutions is progressing nicely.